We couldn’t be happier – conversion rates are up, costs are down, ROI has doubled. Inkjet Wholesale is a warehouse-direct supplier of inkjet, laser, and copier consumables. 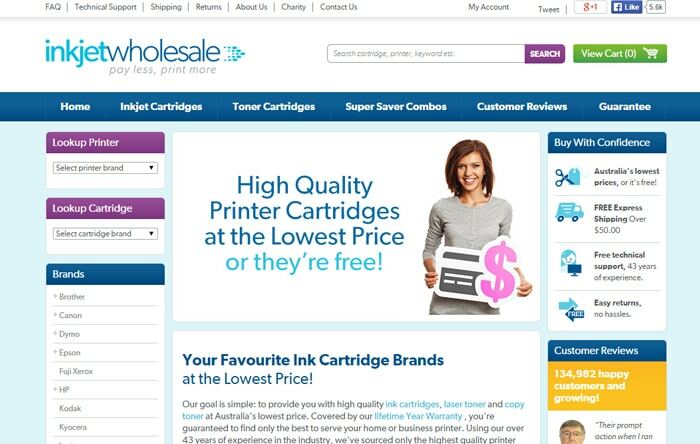 With guarantees on price, products, and service, Inkjet Wholesale has carved out a highly successful niche as an online alternative for printer and copier consumables. Inkjet Wholesale had advertised profitably on Google AdWords for quite some time, and had always managed their campaigns internally. But as the business continued to grow, there never seemed to be time to proactively manage the account. Their AdWords ROI started to suffer as both competition and costs increased. With their in-house resources kept busy, Inkjet Wholesale were after an external party who could revitalise Google AdWords as a highly profitable source of revenue. After speaking with many consultants and marketing agencies, Inkjet Wholesale decided to engage Marketing Results on a 90-day pilot program. Boost overall profitability of Google AdWords by increasing the sales conversion rate of AdWords traffic. Generate more PPC (Pay-Per-Click) sales at lower average cost by optimising Google AdWords account settings. Conducted a thorough SWOT analysis of the Inkjet Wholesale AdWords account, to identify current strengths, areas for improvement, and future opportunities to boost results. Rebuilt Google AdWords campaigns by strategically adjusting campaign settings, targeting, and ad messaging. Proactively optimised Google AdWords to drive high quality traffic and increase PPC sales conversion rates. AdWords return-on-investment (ROI) doubled within three months — Inkjet Wholesale halved their AdWords bill, without losing any sales revenue. In fact, revenue has even increased! Cost-of-sale decreased dramatically by 50%, with higher-than-ever sales conversion rates. Our AdWords campaigns were built back in 2005 and at that time there simply was no one in the organisation experienced in this area. Furthermore as we were a new start-up, the budget simply was not there to employ or outsource the work. Consequently the work fell to myself, as the proprietor, to engage in a rather steep learning curve. I continued to create the campaigns and maintain the AdWords up until 2012. I simply never became proficient in this area and because of this, our conversion rates, traffic volume and bids were extremely poor and our AdWords costs were outrageously high. So our costs continued to climb, while our conversion rates remained flat or marginally increased at best. [We discovered Marketing Results] as a result of professional connections and positive feedback from others. We then undertook our own investigations [with] meetings with MR consultants and several other industry recognised companies. After engaging in this process, our team were clearly impressed with the knowledge, professionalism of MR, but by far the best of all is that they immediately demonstrated a clear understanding of OUR needs and the levels we wanted to achieve. Therefore a decision was taken to commission MR for a 90 day pilot program and we couldn’t be happier, conversion rates are up, costs are down. Enquiries have increased – however, the biggest change is in the ROI in respect to conversion rates. ROI has doubled within three months. So extrapolating this, we could confidently say that we have halved our AdWords bill without losing any sales revenue whatsoever – and in fact we have increased our revenue marginally.